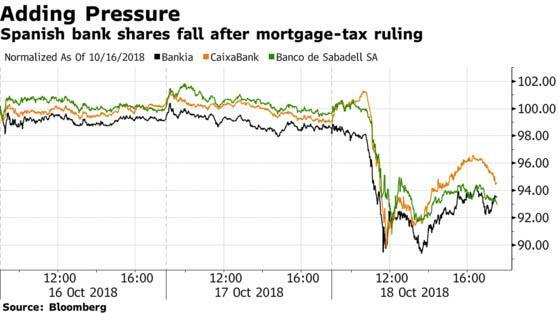 There are also Spain-specific news that have pushed yields wider, to wit yesterday's ruling by the nation’s Supreme Court they must pay a one-time tax of about 1% on mortgage loans that traditionally was passed to their clients. The report sent Spanish banks tumbling as much as 6.3% at Banco de Sabadell while banking giant BBVA dropped 1.8%, thanks to its larger international business that cushions the impact of the ruling. The levy is applied to the mortgage guarantee - the loan amount plus possible foreclosure costs - and could be roughly 1,500 euros ($1,728) on a 180,000-euro loan in Madrid, according to Angel Mejias, an attorney at M de Santiago Abogados in the capital. That said, on Friday Spanish banks rebounded, erasing earlier losses after the Supreme Court announced it would call a plenary session to decide whether Thursday’s mortgage-documentation taxes ruling should be confirmed, adding that the new ruling is a U-tern from previous legislation, with "huge economic and social impact." Whatever the outcome, attention will remain focused on Italy where earlier today yields continued to drift wider, hitting a new of 3.808% before paring the move to 3.73%, still 5bps higher on the day. 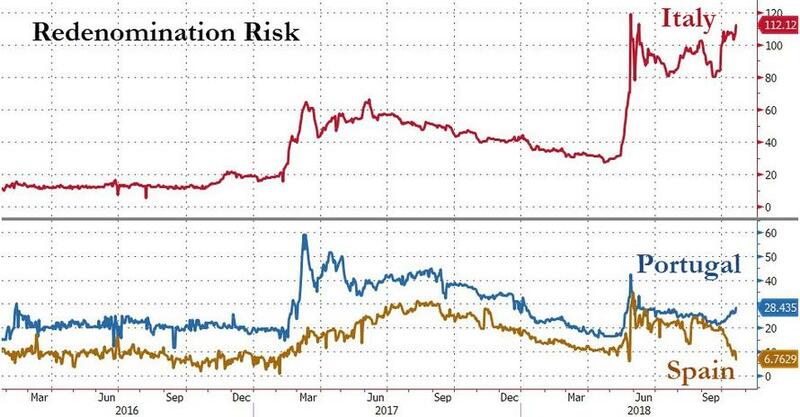 And while the Italian deficit showdown with the EU as well as the "Doom loop" have both been extensively discussed, and are widely seen as the reason behind the recent weakness in Italian assets, in a concerning development, on Thursday there was anecdotal reports that a reason behind yesterday's sharp spike in 3-month USD Libor, which jumped 2.4bps to 2.469% - the sharpest move since March - was a scramble by Italian banks to secure dollar funding, as Italy's redenomination risk has started drifting wider once again. The banks are flipping high-quality liquid assets (HQLA BTPs), which they are required to hold to satisfy capital ratios under Basel rules. They pledge the BTPs into the repo market then swap euros for dollars to avoid paying up in the straight depo markets. The BTPs remain HQLA and will continue to be high quality even if both S&P and Moody's downgrade Italian sovereign debt later this month (S&P rates on the 26th). That is because DBRS currently rates Italy as investment grade BBB. As a reminder, there is some risk that either S&P or Moody's or both rating agencies can further downgrade Italy's credit rating later today, although if DBRS retains its BBB anchor investment grade until 2019, at least Italian collateral will remain eligible for ECB purposes. So while BTP/Bund spreads will likely widen in the event of a downgrade, Cignarella notes not to expect any haircut from the ECB. That said, watch Italian bank CDS: "holding falling securities will likely weigh on the banks' credit quality, raising their borrowing costs." Ultimately, it all boils down to the cabinet's standoff with Brussels: should the war of words escalate between the EU commission and the populist government, Italian assets will get (much) worse before they get better.